As we are coming towards the end of summer when the ground is at its hardest, it is worth thinking about the ways we work and exercise our horses. As every horse owner knows, the feet and legs are a horse's most valuable assets and will determine the health and duration of its working life. But this doesn’t just involve the hooves and bones and many tend to forget the joints and the role they play in maintaining sound conformation. While daily wear and tear of joints cannot be avoided completely, there are a number of ways to reduce its impact. Observing consistent joint care is important in all horses, especially those competing and/or being worked on particularly hard or rough ground. Not only does ongoing joint care reduce the potential for injury and joint complaints but it promotes better fitness and performance. The synovial joints (these being the moveable joints, such as the knees, fetlocks, stifles and hocks) are particularly affected by hard ground surfaces and are the joints most often implicated in injury. Horses that jump are especially prone to joint problems because of the demands of their discipline. Landing a jump places extreme pressure on the forelimbs as the entire body weight of the horse (and rider) resides on one leg momentarily. Horses that are raced or strenuously exercised over hard ground are also more prone to joint complaints, with the joints absorbing bigger impact. The joints have several functions – to absorb shock, facilitate free and easy movement and support the weight of the body. A joint problem arises when damage occurs faster than repair. If the joint is weakened through injury or everyday wear and tear, the horse is no longer supported or fully mobile. Age and movement will naturally affect the joints, as will general conformation. If a horse is poorly conformed it will be unbalanced and therefore more susceptible to joint problems. In this scenario, compensating joints are placed under increased pressure and are more likely to succumb to injury as well. A problem joint needs to be properly supported as soon as possible so as not to impede the other legs. Diet, fitness, workload and the state of the feet can also contribute to the state of the joints. If one of these areas becomes an issue, an existing joint problem is quickly exacerbated. If you suspect your horse has a joint injury, contact your veterinarian straight away. If you don't, the condition will only get worse, affecting other regions of the horse such as the other limbs, back and hips, leaving you with a much bigger problem on your hands. Lameness and reduced performance are the most obvious signs that something is wrong with your horse, as are visible signs of swelling and evident pain on movement. If the leg feels particularly warm, this could be another sign of a problem. 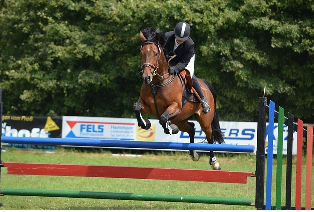 Horses that show jump may refuse the hurdle at the last minute and pull up because they are unbalanced and in pain. When standing, you may notice an uneven distribution of weight (particularly in the hind legs) as your horse tries to relieve its discomfort. So, how can joint injuries be avoided? While there are no gaurantees that your horse will never experience joint problems, there are several things you can do to strengthen and support its joints year-round so that come summer when the ground is hard, your horse is good to go! First things first, it is important to remember that even with ongoing joint care, injuries may arise if your horse is over-worked or over-ridden on difficult and uncompromising terrain. Try to limit particularly strenuous activity as much as possible to help reduce the amount of stress to the joints. 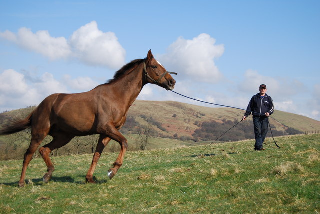 If your equine is exercised regularly, make sure you always incorporate an effective warm up and cool down into the session to prevent friction occurring in the joint. Secondly, it might be beneficial gradually introducing your horse to new ground surfaces from a young age. Gentle exercise on hard ground may help your equine build a resistance to the surface in the long-run, although the merit of this is disputed. It is generally accepted that when it comes to joint supplementation, glucosamine is the way forward. Glucosamine is an amino sugar that is well known for its beneficial properties in the effective maintenance of joints. The ingredient helps to support and strengthen joints, keeping them supple for free and easy movement. Many veterinarians recommend using a joint supplement for horses, particularly when it comes to show and competition animals. VioVet sells a range of equine joint supplements, including Cortaflex, a formulation that is geared at managing joint degeneration, damage and ageing in a fortified liquid or powder form, Maxaflex, for long-term maintenance of joints, and Synoquin, for helping to relieve joint stiffness and reduce symptoms of degeneration. To view our complete range of joint supplements for horses, click here.